Turista mobiliado 4 **** em ambiente privilegiado, calmo, conforto, decoração ..
Idealmente localizado, muito tranquilo, confortável, decorado com bom gosto, no coração da marina em Saint Cyprien, perto de todas as comodidades em uma localização privilegiada em uma pequena ilha, com acesso por uma pequena ponte, sem tráfego, terraço beira-mar de madeira com integrada LED para iluminação ambiente noite, praia 5 minutos a pé, internet, 15 km Perpignan Collioure e 15 km, 30 km a Espanha, alojamento mobilado 4 **** (decisão de classificação No. 06604066-17116-0044) inscrito no escritório de turismo em Saint Cyprien. Sehr schön gelegen, direkt am Hafen. Schickes kleines Haus, gut ausgestattet, Mini-WC. Schöner Zugang zum Hafen und zum Strand. We enjoyed our stay in this Saint-Cyprien villa very much. Although small, it is beautifully appointed, with a lovely terrace on which to enjoy meals and the view. It is very well stocked with all the necessities for cooking and serving food and wine. The beds were very comfortable and the rooms efficiently organized for storage of our luggage and its contents. Denis is an exceptionally accommodating host and very helpful with all our queries. Only the small stairs down from the bedrooms to the toilet were an issue for us as we are seniors. Petite location magnifique, très propre où rien ne manque. Si nous retournons dans cette région, nous aimerions y retourner. Lovely property in a super location. We spent a lovely week in this superb little house. Due to a delayed flight we arrived very late, but after a couple of phone calls we were greeted by Ms Gomez. What a lovely lady, she proceeded to explain all about the house. 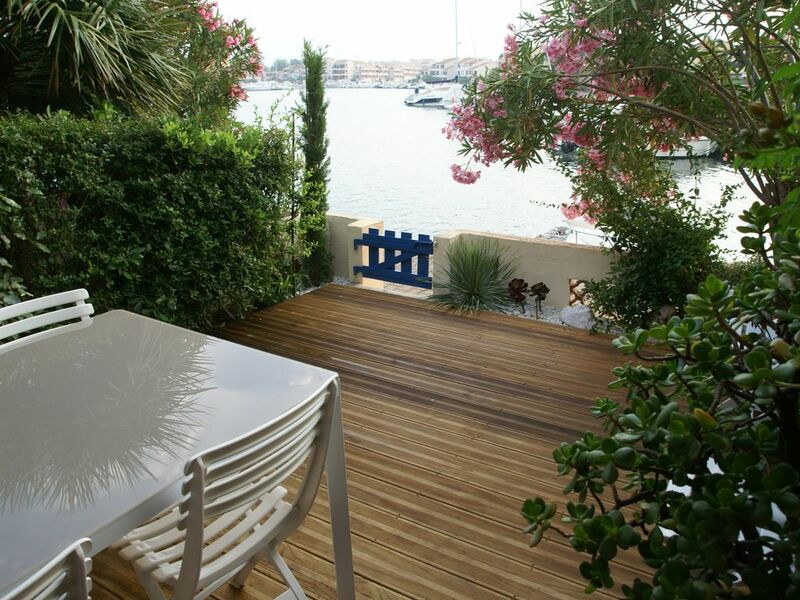 The house is situated on a quiet part of the marina. My Wife had her breakfast on the first floor balcony, while I made use of the bicycle for an hour or so every morning. A short walk (around 6 mins) to the beach with a really nice beach bar, and a resturant a little further down the beach. A 20 minute walk will get you to the busy Port area, this has all the shops and resturants you could require. The accomodation was very clean and well equipped with all the utensils you would need. We had all our meals at the lovely table on the decking overlooking the marina. pegue a rodovia Narbonne - Perpignan. 1. saída Perpigan sud, siga Elne, Argelès ou 2. saída 40 Leucate, em seguida, Canet, Saint Cyprien estrada mais bonita entre mar e lagoas). Visite o jardim das plantas de Saint Cyprien, traga as crianças ao parque do Prade ligando a aldeia de Saint Cyprien à praia de Saint Cyprien, pratique esportes no Grand Stade (ao lado do jardim das plantas) com suas 23 quadras de tênis, squash, padel , muscu, fitness, piscina ... em uma bela área.